Diaristic Notations: Shopping is not fun. If the Gov. 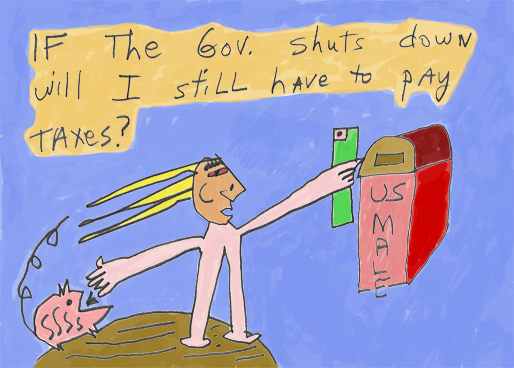 shuts down will I still have to pay taxes? US Male. I like to wear large shirts. My wife says they don't fit and buys me medium shirts. I don't like them because they fit kind of snug, and then I feel constrained. So I returned the medium shirt to Nordstrum's Rack, and then bought a large Hawaiian shirt from Costco. She thought it was beautiful when I had it in my hands. "Oh, it is polyester," she said. Then she looked at the tag and saw that it was silk. One point for me. Then I put it on, and she said, "but it is too big." So it, as comfortable as it was, will go back to Costco. I bought some tuna... or, kind of. I put eight cans in my cart. I figured I could have half of a can a day... and it would last sixteen days... and I would get some good protein. Then I went to the self check-out line at Costco and told the roving helper there that I didn't want it. I set it on top of the scanning station. I kept asking myself, "should I" or "shouldn't I?" I've heard that we make unconscious decisions before we make conscious decisions. And then we rationalize to explain to ourselves and others why we do things. The truth is, we don't know. Anyway, I then switched sides (they used to call me "jelly Mosley") and decided to buy the tuna. I turned toward the place I had set the cans, and alas, they were gone. Problem solved. Why did I write about the shirts and the tuna? It is the free samples and the Talmud that interest me most. So the Talmud says to contain one's passion, but to not pass up an opportunity for pleasure. I tried some great guacamole salsa and chips. The salsa was made by a company called Fat Tomato... or something like that. I asked the demonstrator why they'd call a company that. She said because they only use the fattest tomatoes. So not to pass up an opportunity for pleasure, I not only took a second sample (I asked first), even if it was against my "rules," but I put a jar of the salsa into my cart. I told the cute woman who was preparing the sample that this is the first time I bought something I sampled. She said she was doubly pleased, since it was my first time. I didn't tell her that her looks were the tipping point. I wheeled my cart about ten feet from the stand, and wondered how I was going to eat the big bottle in 3 or 4 weeks, supposedly its shelf life. I returned the bottle to her, saying, "I'm sorry. I don't think I'll be able to use it." "Well, thank you anyway," she said. Again, a "jelly Mosley" move. One more thing. I've been trying to quit reading email all day long. I decided this morning that I'd just do it three times a day. Three is such a great number. Everything in Buddhism comes in three. Everything, that is, except for those things that don't. In any case, I lasted about 2 hours. I think it is harder than quitting smoking. Imaging knowing that you have mail in the mailbox but have to wait 5 hours to see what it is. For some, it is a piece of cake. For others (like me), it is excruciating. In Buddhism, we call that "an opportunity for practice." In the Talmud, it is an opportunity to contain passion. Passion? Maybe it is not passion that drives us to see if "I got mail."